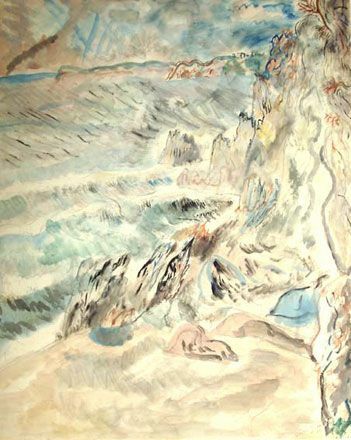 David Jones is regarded as one of Britain's most important 20th Century artists. He was one of the finest British watercolourists and printmakers of his generation and a gifted poet. He was born in London in 1895 to a Welsh father and English mother. From early childhood, drawing was his constant occupation. He went to Camberwell School of Art until the outbreak of war in 1914, when he became a Private in the trenches. His experiences there were to have a major impact on the remainder of his life and work. Jones' conversion to Roman Catholicism and subsequent friendship with Eric Gill influenced his work greatly. After a spell of living within a lay community in Ditchling, Sussex, he moved to live within another lay community at Capel-y-Ffin, in the Black Mountains of Wales in 1925, and revelled in the surrounding landscape which inspired him greatly. 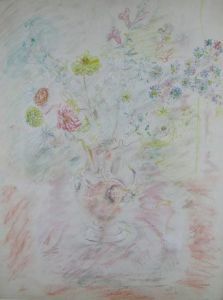 His paintings, drawings and etchings have metaphorical, mythical, historical and metaphysical meanings. They involve legends of Arthurian tales and very often have strong religious overtones. His service in World War I lead to his writing the epic war poem In Parenthesis, published in 1937 and heralded as ‘a work of genius’ by T.S. Eliot. It is now considered one of the greatest of all war poems. David Jones' reputation as an unique and significant artist has continued to grow and the recent centenary commemorations of World War 1 have brought his importance further into focus.